Wow! That was our reaction to seeing this picture (and others) of a light show aboard the International Space Station. After confirming with NASA that the images circulating lately on social media are real, we were directed to the Japan Aerospace Exploration Agency (JAXA), who co-ordinated this experiment. 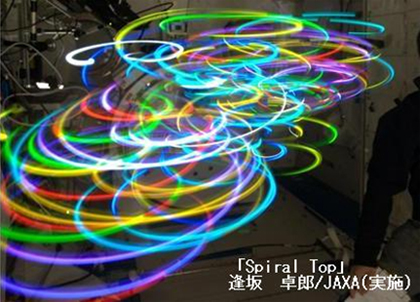 The work is called “Auroral Oval Spiral Top” and was done in the Kibo module on May 12, 2011, JAXA said. This was the second version of the experiment, which initially ran April 30, 2009 during Expedition 19. “Auroral Oval Spiral Top uses a spinning top that has arms illuminating with LED linear light sources and point light sources. Various movements of the spinning top floating in microgravity show aurora-like light traces,” JAXA stated on a web page about the experiment. Takuro Osaka, a professor at the University of Tsukuba, was the principal investigator of this art project. What are your favorite experiments performed by astronauts in space? Let us know in the comments.